BIC Services are delighted to announce another award win!! 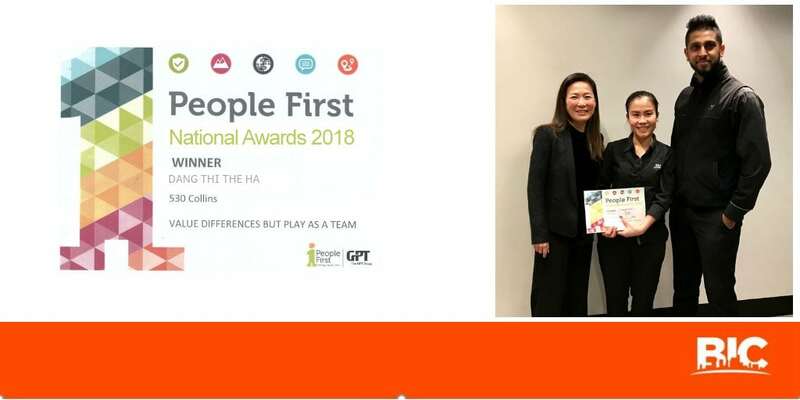 Our very valued employee Dang Thi The Ha was recently awarded GPT’s “People First Award” after finding and reporting a wallet, containing a substantial amount of money, in the food court at 530 Collins St, Melbourne. In recognition of her honesty and outstanding work ethic, Ha’s wonderful actions were highlighted to the rest of the 530 Collins St team where she was presented with her award and a gift voucher to the value of $100. Acknowledging how valuable these attributes are to both BIC Services and GPT, all management were in attendance and the gift and award were presented by CRM of 530 Collins St, Sing Yi. The nature of this Award is of great pride to BIC Services as it recognises honesty and integrity – values at the heart of our culture. Marc Larcoste, National Manager GPT Concierge Services was also in attendance and announced 530 Collins and 580 George St as the highest performing of GPT’s Australian assets. As both these properties are facilitated by B.I.C. Services, we’ve no doubt the outstanding, high-quality service provided by our valuable teams contribute to the outstanding results of these assets. Our sincere congratulations and appreciation to both teams.